Alcids (or auks) fill a similar ecological niche in the northern hemisphere as penguins do in the southern hemisphere, except alcids can fly — and can fly long distances. The top photo is of a mixed group of Rhinoceros Auklets and Common Murres in flight over Monterey Bay in February, some having flown thousands of miles from Alaska to reach that rich pelagic wintering locale. To quote Nettleship (1996), alcids are "a highly specialized and ecologically diverse group of marine, wing-propelled pursuit-diving birds." Many live at high northern latitudes — like this group of Atlantic Puffins and Razorbills (left) on Machias Seal Island, Canada — where their fat well-insulated bodies and comical appearances add to the feeling that they recall "northern penguins." Like penguins, though, some species reach tropical latitudes. In the north Pacific, a diverse set of species pursue krill and bait fish in cold waters throughout the day, coming ashore only during the short breeding season to nest in crevices or offshore islets protected from predators. Some small species only fly to their burrows after dark, so as to avoid predation by gulls. With such a wide variety of species sometimes competing in the same waters, body and bill sizes have distinctly evolved to carve out specialized niches. Two unique Bering Sea alcids are Crested Auklets and the tiny Least Auklets, shown together on St. Lawrence I. (right). No alcids have a more dramatically modified bill than the three species of puffin. The breeding range of Tufted Puffin is from Alaska to California, with the southernmost permanent colony on the Farallon Islands, 27 mi W of San Francisco. The five species of alcids that nest there have been very well studied over the past few decades (Ainley & Boekelheide 1990), providing much information about, for example, the effects of El Niño on these species. 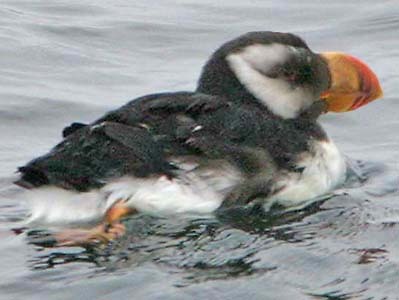 Horned Puffin is more northerly. In an unprecedented invasion, both species were present near-shore on Monterey Bay in spring-summer 2007: Horned Puffin (below left) and Tufted Puffin (below right). I live on the shores of Monterey Bay, California, where ten alcid taxa are regular (currently considered 9 species until Xantus's Murrelet Synthliboramphus h. hypoleucus and S. h. scrippsi are split) , and three more species occur as vagrants. Thus over half of the world's alcids have be recorded here. The local breeder is Pigeon Guillemot, which has a black summer plumage (above & right). It nests under the wharves and piers in Monterey harbor and Cannery Row, and can be seen bringing small rockfish to its young (right). Pigeon Guillemot in Monterey are present from March-October, but nearly the entire population departs during winter. It is believed that these birds migrate north to winter in the Puget Sound vicinity. The very few that remain appear to be in pale first-winter plumage (below left). "Scripps'" Murrelet, the northern race of Xantus's Murrelet, breeds on the Channel Islands off southern California. Rather little is known of its at-sea biology after the young leave the nesting burrows, but we have found fledglings, still wearing natal down feathers, accompanied by an adult (presumably the father) in mid-summer offshore Monterey (left). Presumably these father-chick 'pairs' have swum that distance, aided by the prevailing currents. Father-chick 'pairings' are also the norm for Common Murre, which breeds in abundance on the Farallon Islands, and also some offshore rocks along the Big Sur coast. Like most alcids. murres nest in dense colonies. On inaccessible ledges they are so closely packed together that the eggs or chicks are protected entirely by the adults. Many smaller species nest underground in burrows or crevices. Most pairs produce but one young a year. Marbled Murrelet is our local endangered species. It nests mostly in old growth forests where a single egg is laid hundreds of feet off the ground on a thick mossy limb. This inaccessible habitat was responsible for its being the final North American species to have its nest discovered, in Big Basin Redwoods park in the Santa Cruz Mts., in 1974 (Binford et al. 1975). 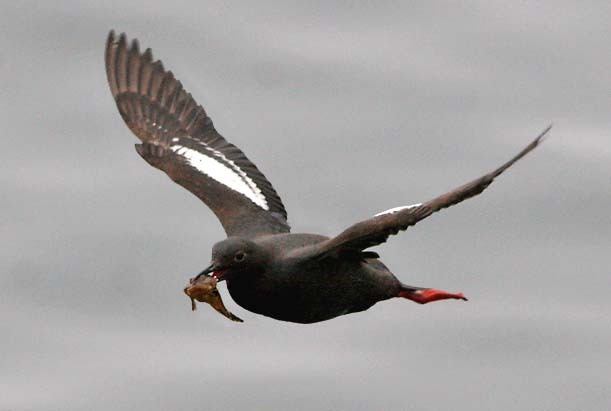 Adults are patterned in brown-and-buff barring, making them invisible when sitting on a nest, but the young and winter adults wear a striking black-and-white plumage on the ocean. 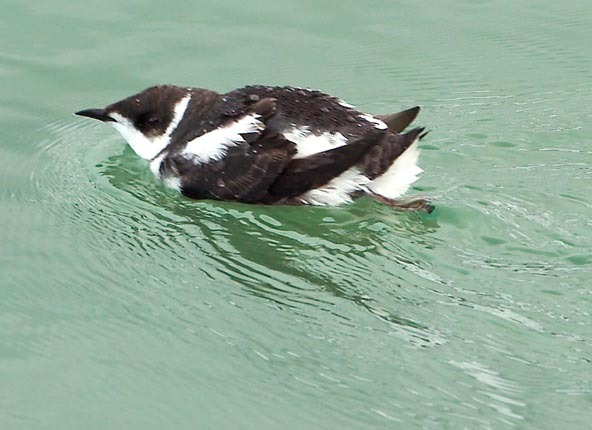 They can be difficult to locate on the ocean off sandy beaches, but this Marbled Murrelet was photographed inside Monterey harbor (fabulous shot © Bill Hill). There were flightless alcids in historic times past, the most recent of which was the Great Auk Pinguinus impennis. It occupied boreal latitudes across the north Atlantic, and was easy prey to whalers and eggers. The last pair known were collected for a museum on a small island off Iceland on 2 June 1844. Photos: The flock of Rhinoceros Auklet Cerorhinca monocerata and Common Murre Uria aalge were in flight over Monterey Bay, California, on 9 Feb 2003. 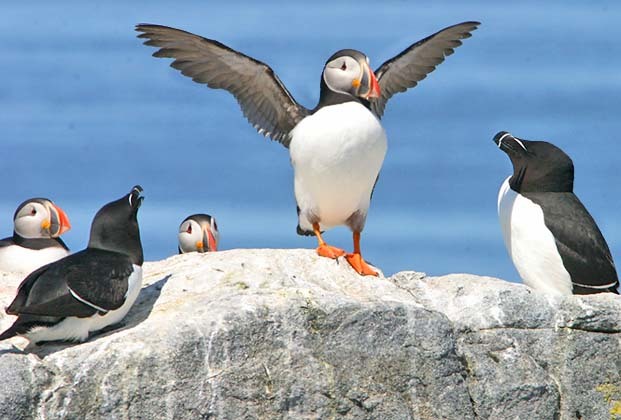 The group of Atlantic Puffin Fratercula arctica and Razorbill Alca torda were on Machias Seal Island, Canada, off Cutler, Maine on 19 June 2007. 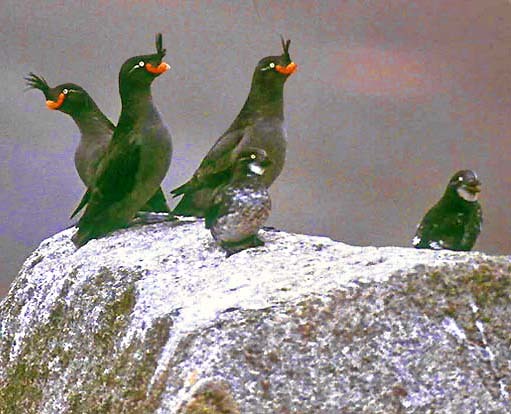 The rock on St. Lawrence I., Alaska, in June 1980 has three Crested Auklet Aethia cristatella and two Least Auklet A. pusilla. 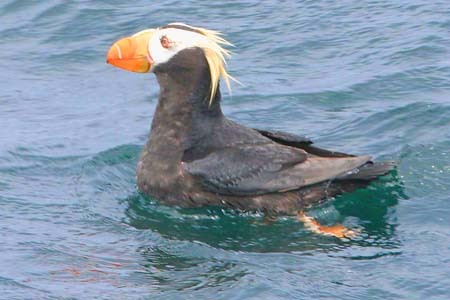 The Horned Puffin Fratercula corniculata and Tufted Puffin F. cirrhata were both just offshore Monterey's Cannery Row on 19 May 2007. The courting pair of Pigeon Guillemot Cepphus columba were in Monterey harbor, California, in March 2007; the adult was carrying food on 26 July 2009, and the first-winter bird was there on 4 Feb 2009. The Craveri's Murrelet Synthliboramphus craveri was inside Moss Landing harbor, Monterey Co., California, on 7 Oct 1978; this is the only one ever to be seen inside the harbor, and this is the photograph I have sold the most often, as shots of this enigmatic species are difficult to locate. 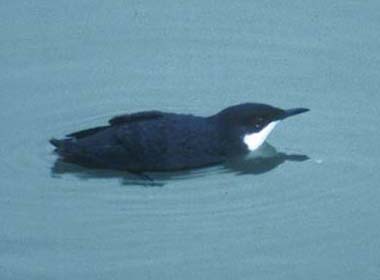 The still-downy Scripps' Xantus's Murrelet Synthliboramphus hypoleucos scrippsi was offshore Monterey on 14 Aug 2005. 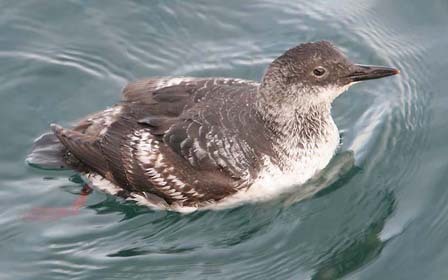 Bill Hill photographed the Marbled Murrelet Brachyramphus marmoratus in Monterey harbor in Jan 2005. All photo © Don Roberson, except Marbled Murrelet © Bill Hill, used with permission; all rights reserved. There is a family book in the uniformly solid Oxford Press series on bird families of the world (Gaston & Jones), but I have not yet seen it. The Atlantic alcidae were thoroughly covered by Nettleship & Birkhead (1985). The account by Nettleship (1996) in the Handbook of the Birds of the World series is a very fine introduction. Ainley, D.G., and R.J. Boekelheide, eds. 1990. Seabirds of the Farallon Islands. Stanford Univ. Press, Stanford, CA. Binford, L.C., B.G. Elliott, and S.W. Singer. 1975. Discovery of a nest and the downy young of the Marbled Murrelet. Wilson Bull. 87:303-319. Olsen, S.L. 1996. 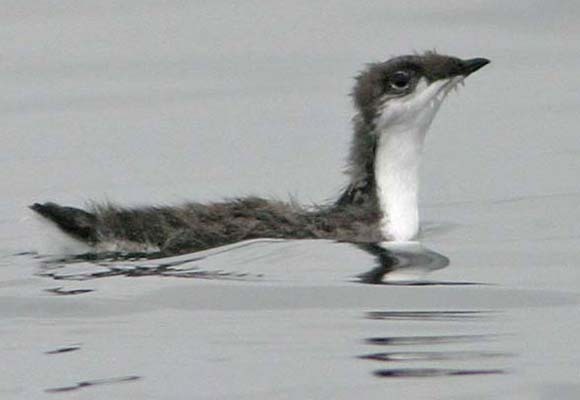 The name of the Craveri Brothers' Murrelet. West. Birds 27:167-168. Nettleship, D.N., and T.R. Birkhead, eds. 1985. The Atlantic Alcidae: the Evolution, Distribution and Biology of the Auks inhabiting the Atlantic Ocean and adjacent water areas. Academic Press, London. Nettleship, D. 1996. Family Alcidae (Alcids). Pp. 678-722 in del Hoyo, J., Elliott, A., & Sargatal, J., eds. Handbook of the Birds of the World. Vol. 3. Lynx Edicions, Barcelona.